It's another Airtime giveaway to the top commenters of Entclass Blog for the month of April. 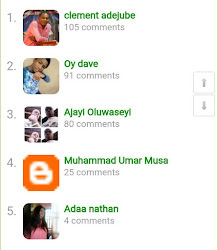 As usual, i will be rewarding the top 5 commenters of Entclass Blog for the month of April, like I've been always doing. These are the people that took their time to drop a comment or reply to comments on any post published on this blog, from the beginning of each month, to the end of that month. And I'm giving out the little i earn from this blog, because without you guys here, i wouldn't have any reason publishing new posts and cheats on this blog. Interestingly, there's a lady on the list for this month. Below are the top five peeps that made the list for the month of April 2017. Congratulations to them. Lest i forget, there are some criminals who rush to create fake Google ID just to deceive me in sending them the Airtime, please try your best. I have a trick which i use to spot fake Google accounts before sending out Airtime. ETISALAT, KASHI WHAT REALLY HAPPEN IN THIS SITE? You might be commenting quite alright, but your comments are too small to make up the top 5 commenters list. Lolz.... Victor kachi you are really doing a great work here Keep it up. Kachi my Profile appear in two different ways here... why?